As the age of the Internet continues to produce more and more strange trends and technical advancements, all kinds of new products and services constantly pop up. Some of these come and go, while others gain immense popularity. Perhaps the most interesting Internet phenomenon of recent times – and maybe ever, given the groundswell of fundamental change it represents – is the rise of Bitcoin and cryptocurrency. Also quite interesting is that fact that online, offshore sportsbooks were among the very first commercial business to accept Bitcoin deposits (with some conspiracists even claiming that sports betting was the direct impetus for the creation of Bitcoin in the first place). Simply put, Bitcoin is a form of Internet currency, created by an unknown man or team using a false name (“Satoshi Nakamoto”). Bitcoin pioneered the technical concept known as the “blockchain,” which is a revolutionary, quantum-hacking-resistant data ledger that provides the greatest-known transaction encryption. Bitcoin is traded as a stock or commodity, and its value goes up and down depending on market trends. There is a very active online Bitcoin community, so it only makes sense that sports betting sites would embrace this technology. And they have! Even better, because Bitcoin is decentralized, there are no banking institutions or government agencies involved in any Bitcoin transaction, making it ideal for things like sports betting where privacy is key. As such, Bitcoin is beginning to be accepted by more and more companies and service providers worldwide. With no “home nation,” Bitcoin currency has no national affiliation and therefore is not subject to conversion fees like many other currencies. Read on and learn how Bitcoin can now be used to deposit into several of the sportsbooks for USA players. We also explain the advantages and disadvantages of Bitcoin sportsbooks as well as the rules and stipulations governing Bitcoin use at legal offshore sportsbooks. 100% Success Rate On Deposits - Bitcoin is not tied to any nation and therefore cannot be regulated by any nation. While the U.S. can attempt to stop transactions to and from betting websites that involve U.S. currency, they cannot do anything about exchanges using Bitcoin. No Surcharge When Used At Online Sportsbooks - Currently most other sportsbook deposit methods on other betting sites incur some form of fee charged by the service used to deposit. Because depositing with Bitcoin is essentially exchanging one form of currency for another, there is no fee. Quick + Instant Deposit Capabilities - Bitcoin is very quick to deposit, with most transactions being processed within 1 to 2 hours. Many forms of deposits often can take days or weeks to ship to the provider of a site and then be processed by said provider. Bitcoin is exchanged over the Internet and therefore are converted and credited relatively quickly. There is a huge number of online, offshore sportsbooks that accept Bitcoin, but due to the nature of Bitcoin itself, support for the cryptocurrency is not any actual indication of a sports betting provider’s reliability or good standing in the wagering community. Because Bitcoin is decentralized, there are many scams and criminals that use the currency, too. Separating the fly-by-night scam sites from reputable books can sometimes seem a truly daunting task. Fortunately, it’s really not. That’s because all the best sportsbooks also welcome Bitcoin deposits. In fact, because it takes meddlesome banking institutions and governmental oversight out of the equation, Bitcoin is fast becoming the preferred payment mechanism at all the top offshore sportsbooks. The following online bookmakers have been accepting Bitcoin for years, and each provides you with plenty of incentive to use this new form of payment. BetOnline Sportsbook - Bitcoin Bonus Up To $1000! BetOnline supports a handful of popular cryptocurrencies, but Bitcoin remains by far the site’s most popular way to process deposits. Over half of all of BetOnline’s customers now use Bitcoin, and to encourage you to jump on the bandwagon, BetOnline is offering a Crypto Welcome Bonus. This Bitcoin bonus will match your deposit by 100%, and with up to $1000 in extra free plays, you can basically double your bankroll right off the hop just by depositing with cryptocurrency. When you deposit with Bitcoin at BetOnline, your funds are instantly converted to USD, which is how they’ll show up on the site. The conversion rate will reflect the live value of where Bitcoin is trading at the moment you deposit, and BetOnline is totally transparent about the entire process. When you deposit with Bitcoin at BetOnline, just use promo code “CRYPTO100” and hit the books! Bovada Sportsbook – The Biggest Bitcoin Bonus On The Internet! Bovada is the most popular sports betting site in the US, and for good reason. And though the service isn’t known for its varied deposit menu, it does accept Bitcoin and Bitcoin Cash. In fact, it was one of the first sites to accept either of these cryptocurrencies, and though other competitors might offer support for a wider range of cryptos, nobody has a Bitcoin Bonus as big as Bovada’s. When you sign up with Bitcoin (or Bitcoin Cash) at Bovada, you can claim up to $500 in sportsbook free-plays with promo code BVSBITCOIN50, which matches your initial deposit by 50%. To maximize your Bitcoin at Bovada, you can get $4500 more in free-plays to put towards the site’s robust casino menu by using code BVCBITCOIN150 (redeemable 3X). Rollover is 5X for the sports promo (which is also usable at Bovada’s racebook), and it’s 30X on casino games. 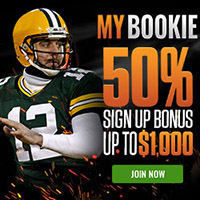 MyBookie Sportsbook – Over 70% Of Customers Use Bitcoin! At MyBookie, 72% of customers now exclusively use Bitcoin to deposit and withdrawal. Because there are no added fees for either option, this is the best way to maximize your investment and minimize any associated expenses with your sports wagering hobby. After all, betting on the games is risky enough – you shouldn’t have to spend even more money just to fund your account or claim payouts. While MyBookie does not offer a dedicated Bitcoin bonus, you can redeem any of the site’s several new-member and reload bonuses with Bitcoin. When you make your very first deposit at MyBookie with Bitcoin, just type in “MYB50” in the appropriate field and you’ll have up to $1000 added to your account (10X rollover). You can also claim up to $750 in casino bonuses and take advantage of the site’s $20 risk-free bet on your first wager. Returning Bitcoin depositors can get a 25% sportsbook reload bonus worth up to $500 by using promo code MYB25 when adding fresh funds to their MyBookie accounts (5X rollover).